UPDATE: So it IS an April fools day joke. Or just a random hoax, no one’s quite sure. When we read on Gizmodo this morning that Kanye West was setting up his own tech company we were excited.. Really excited. This is it, the first step in Kanye taking over the world. Next there’ll be Kanye snacks, Kanye clothing, Kanye housing. Our imaginations are running wild. The sensible ones in the office told us (ok me) to hold our horses. Could this be a prank for April fools day they said. No I said. This is it. This is the beginning. First whodat.biz, next the globe. Scrap that. The universe. Luckily i wrote that it could well be a prank (see, in the final paragraph) and a number of sources have revealed that yes, it was all one big joke. We’re sorry for falling for it. But admit it, you did too. However, rather than being embarrassed, we’re actually just really disappointed. Come on Kanye, you owe us a tech startup and you owe us it NOW. 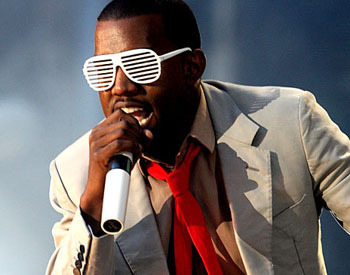 Although Watch The Throne is one of Shiny Shiny’s all time favourite albums, we haven’t been sure what to make of Kanye West since he replaced his teeth with ACTUAL METAL and then began the most insane Twitter tirade in which he shared his arrogant (yet kinda creative) views about tech, architecture, design, education. Oh let’s just elect him as KING OF THE WORLD and be done with it already. Well now according to Gizmodo, details of his first venture since he set up his start-up Donda Media have been revealed. Drum roll please… It’s called WhoDat.biz (of course it is) and the tagline is “the Facebook of websites”, which is so fabulously cryptic. It basically tells you who owns websites, which we’re pretty sure a LOT of other companies do already. But, we’re hoping Kanye has something pretty special up his sleeve with this one and doesn’t think he’s come up with the idea himself. At first we thought this might be some kind of April Fools’ Day joke, but we’re now convinced that it’s such a strange move it could have only come from the mind of Kanye West. Will there really be THREE Amazon Kindle Fire 2 models? STUDY: Are photo apps the most annoying thing about Facebook?